“Hard Spots” in submerged arc welds have caused major weld failures. This problem was identified in the early 1970’s when some weldments failed within days of being exposed to H2S (hydrogen sulfide.) This can occur in petrochemical processing and in pipelines transporting "Sour Gas." Compared to the much smaller “Hard Spots” recently reported as problems in welds made in HSLA steel, (Reference 1) the “Hard Spots” encountered in the submerged arc welds in question are much harder and much larger! The above mentioned article expressed concern that the hard areas in MIG welds in HSLA steel that caused cracking problems in a H2S test were about as big as the hardness tester indenter. As can be seen in micrographs below, “Hard Spots” in a failed sub arc weld made in large diameter transmission pipe were about 40 times the indenter size! Those located at the surface are readily seen by eye! Harry Ebert, an Exxon Welding Engineer at the time, published a paper in 1971 discussing hard welds caused by the use of “active” bonded fluxes and subsequent rapid weld failures (Reference 2.) We worked closely with Exxon, the API Vessel Committee and fabricators defining which combination of fluxes and wires were to be used in the as welded and stress relived condition for this service. 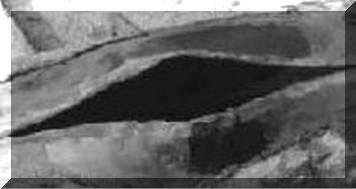 In 1973 a definitive 22 page technical paper was published by Kotecki and Howden, working for Battelle Memorial Institute, regarding submerged arc weld “Hard Spots” (Reference 3.) It clearly showed failures similar to those discussed by Ebert and defines the cause as “Hard Spots” in submerged arc welds made with "active" bonded fluxes, i.e. those containing Ferro Alloys. A majority of bonded (also called agglomerated) fluxes contain Ferro Alloys for a number of flux manufacture and weld performance reasons. 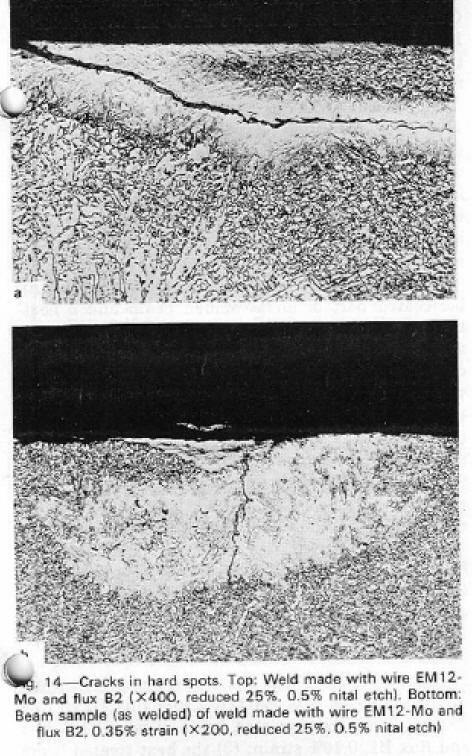 The photo macrograph directly below shows one figure from the Kotecki/Howden report with cracked “Hard Spots.” They found relatively large, very high Mn and Si “Hard Spots” in submerged arc welds made with bonded fluxes. These “Hard Spots.” cracked rapidly when exposed to H2S testing. My early career was in research and development of the submerged arc welding processes, fluxes and wires. I presented technical papers in a number of pipeline conferences on the subject of submerged arc welding natural gas and oil transmission pipe with a welding process we developed that welded long seams in UOE pipe at 3000 amps (Summarized in Reference 4) that doubled existing welding speeds. At these conferences, several papers addressed steels for use in sour natural gas service and the problems with hydrogen sulfide induced cracking. However none discussed possible weld metal problems when subjected to sour gas. With my experience with submerged arc weld “Hard Spots” in pressure vessel failures, I discussed the issue in visits with all North American pipemills. There were nine UOE pipe mills in the US and Canada all of whom were using specially designed high performance fused submerged arc fluxes made especially for this service. 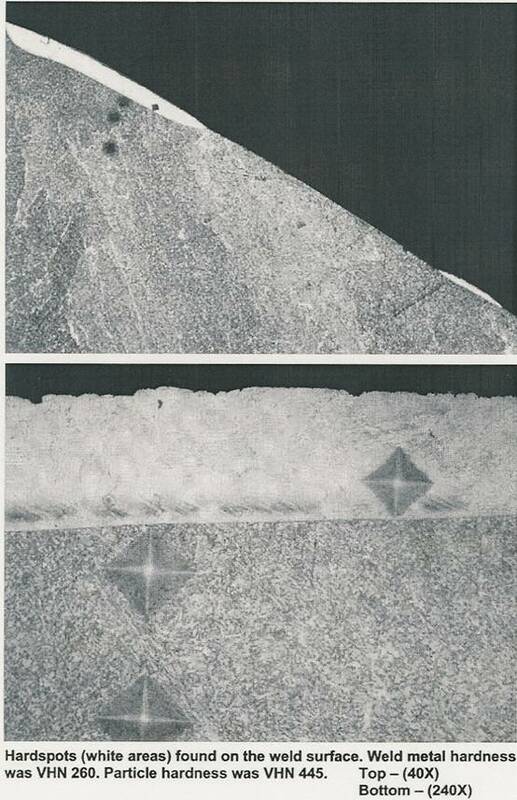 Fused fluxes, as found by Kotecki/Howden did not produce welds containing “Hard Spots.” [ Note: fused fluxes can be fully reacted during manufacture eliminating the production of metal particles while welding. This compares to bonded (also called agglomerated) fluxes whose ingredients are first reacted during welding.] At that time, these UOE pipemills cleaned the steel surface prior to welding. Many used automatic shot blasting of the complete pipe steel surface which helped with subsequent corrosion coating as well as weld performance. A Canadian spiral pipe mill was also manufacturing some natural gas and oil line pipe. This spiral pipe mill also used fused flux specially designed for gas and oil pipe production. Visiting most of the US and Canada UOE natural gas and oil pipemills several times per year, they were verbally told about the concerns of using active bonded fluxes for the manufacture of gas and oil pipe that could be used for transporting sour gas. A spiral pipemill making some gas and oil transmission pipe decided to use an active bonded flux apparently to handle the extra mill scale on their plate. They produced pipe for a natural gas transmission line that was placed in the Grizzly Valley in Canada. It operated satisfactorily for a period of time until a gathering line from a gas field containing sour gas was added. Sections of the line failed catastrophically within a very short time of being put in sour gas service. The failure occurred in very long lengths at several locations! Little is written about this major failure for some legal reasons. However in a Corrosion Conference held in San Francisco on March 9-13, 1987, a technical paper was presented and proceedings published (Reference 5.) One of their conclusions states; "Analysis of failures revealed they (cracks) originated in the inside weld bead of a spiral weld which contained hard areas of Martensite and/or Banite with hardness values between 300 and 500 HV." They go on to say pipe used in this gas line made at another pipe mill (My Note: no doubt a UOE mill using fused flux, since only this one spiral pipemill was making large diameter gas pipe at that time and all UOE pipemills in North America were utilizing fused flux,) had no such “Hard Spots” and that pipe, transporting the same sour gas, did not fail. In 1999, with most of the natural gas and oil pipeline infrastructure in place in the United States, there was only one UOE US pipemill approved for API gas and oil pipe production (now that pipemill is also closed and dismantled.) That mill stopped using their plate surface shot blaster because of high maintenance cost. Therefore the fused submerged arc flux they had been using was replaced with a bonded flux to handle the plate mill scale. [Note, bonded fluxes contain deoxidizers such as Ferromanganese and Ferrosilicon. These Ferro Alloys combine with iron oxide and prevent CO weld porosity from forming. However they also produce Mn and Si rich hard spots!] 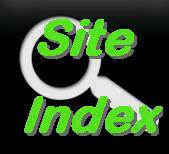 The flux manufacturer designated this grade as being designed for pipe manufacture welding. It was an active bonded flux. We were asked to examine a failed weld made with this flux causing the pipe to burst open during hydro testing. The pipe had failed along the full 40 foot weld seam. We observed several large sections with the crack moving along the weld and in and out of the weld and HAZ. The pipe mill metallurgist found no issues with the steel different than the remaining steel used for all of the pipes being produced for the pipe order. A test for submerged arc weld “Hard Spots” was developed for a major oil company. They will use it in specifications for pipe exposed in Sour Gas Service. The test is simple and involves making a weld pad. Note About Required Sour Gas Corrosion Tests: Some of the corrosion test samples required for pipe used for sour gas service require the weld bead be ground flush with the plate surface. 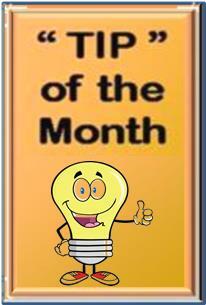 This can eliminated the offending surface "Hard Spot!" It is suggested some corrosion tests be made with the weld reinforcement in place as this is the way the pipe will be used in service! Having extensive experience related to the use of submerged arc welding in the manufacture of natural gas and oil transmission pipe, as well as research experience and patents for fluxes and wires used for submerged arc welding pipe, I am in a unique position to define why these “Hard Spots” exist. I can discuss issues such as flux raw ingredients, raw material sizing, mixing etc that determine their size and frequency. I can help define appropriate tests for these “Hard Spots.” Other welding processes and consumables could possibly cause similar issues. Email to discuss consulting on the subject.